It's Boston, 1919, and the Cast Iron club is packed. On stage, hemopaths-those "afflicted" with the ability to create illusions through art-captivate their audience. Corinne and Ada have been best friends ever since infamous gangster Johnny Dervish recruited them into his circle. By night they perform for Johnny's crowds, and by day they con Boston's elite. When a job goes wrong and Ada is imprisoned, she realises how precarious their position is. After she escapes, two of the Cast Iron's hires are shot and Johnny disappears. With the law closing in, Corinne and Ada are forced to hunt for answers, even as betrayal faces them at every turn. An ideal next read for fans of Libba Bray's The Diviners. "Destiny Soria's debut is without a doubt one of the best of the year." Destiny Soria graduated from Samford University with a B.A. in English. For seven months, she backpacked across New Zealand, supporting herself as a travel writer and tour guide in a haunted prison. She now lives and works in Birmingham, Alabama. 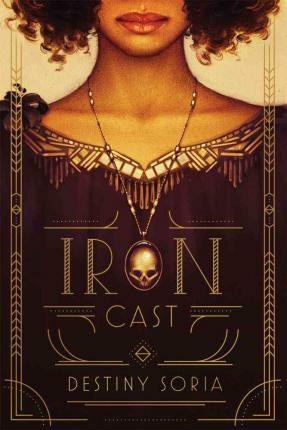 Iron Cast is her debut novel.